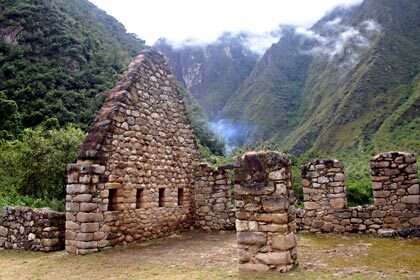 Known as the "Sacred Inca Trail," "Two-Day Trek," or "Camino Real de los Incas," this Camino Inca begins at Km 104 and involves a four hour hike to the ruins of Wiñay Wayna on Day 1, followed by a two hour hike down to Machu Picchu on Day 2. This Inca Trail option offers an alternative to hiking the Classic 4-day 43 kilometer long trail. This shorter trek is more suitable for hikers who have limited time but still desire the "Camino Inca experience." The thrill of observing the sunrise over Machu Picchu from the Inti-Punku (Gate of the Sun) is truly an unforgettable experience. Moreover, this Two-Day Trek allows the hiker to see ruins and waterfalls that those who opt for the Four-Day Trek miss out on. For example directly after crossing the Urubamba River at Km 104, visitors encounter rarely visited Incan Ruins. In addition, the trail passes waterfalls shortly before arriving at Wiñay Wayna where hikers generally spend the night. Immediately after crossing the foot bridge over the Urubamba River at Km 104, hikers encounter the ruins of Chachabamba. These ruins were rediscovered in 1940, and are situated on the ancient Incan road that was located along the south side of the Urubamba River. Some archaeologists suggest that the style of buildings and precision stonework indicate that Chachabamba was an important religious site. In addition, Chachabamba is thought to have played a secondary role as a guard house protecting this entrance to Machu Picchu. After Chachabamba, the Sacred Inca Trail heads south and begins climbing the mountain, before entering the forest and crossing a creek. Then the trail leaves the forest and goes west while continuing the uphill hike in open grassland. After hiking in the sun for about two or three hours, the trail descends into a shaded forest. This is where trekkers can enjoy a beautiful waterfall. After leaving the waterfall and forest trekkers arrive at incredible ruins of Wiñay Wayna. Wiñay Wayna means "Forever Young" in Quechua. 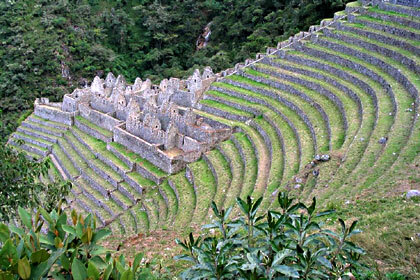 The Wiñay Wayna ruins feature numerous terraces, houses, and a series Inca baths. From the Inca ruins, it is only a few minutes walk the Trekker's Hostel where most visitors spend the night before completing their journey to Machu Picchu the following day. The second day consists of an easy hike trail from the Trekker's Hostel to Machu Picchu and normally only takes about 2 hours. This part of the Camino Inca is the same as that of the Classic Inca Trail (Four-Day Trek). At first, the trail contours the mountainside and then it drops into the rain forest before arriving at a series of 50 steps that lead up to the final pass of Inti Punku, the Sun Gate. From Inti Punku, trekkers get their first glimpse of Machu Picchu in all its glory. Most hikers leave the Hostel before first light so that they can witness Machu Picchu at sunrise. From Inti Punku, the Camino Inca descends to Machu Picchu giving the hiker the satisfaction of knowing that they arrived just as the ancient Incas did, by hiking, rather than by bus like most visitors.